Radius path modifier for offsetting paths. The radius modifier will offset the path to create the effect of adjusting it to the characters radius. It gives good results on navmeshes which have not been offset with the character radius during scan. Especially useful when characters with different radiuses are used on the same navmesh. It is also useful when using rvo local avoidance with the RVONavmesh since the RVONavmesh assumes the navmesh has not been offset with the character radius. 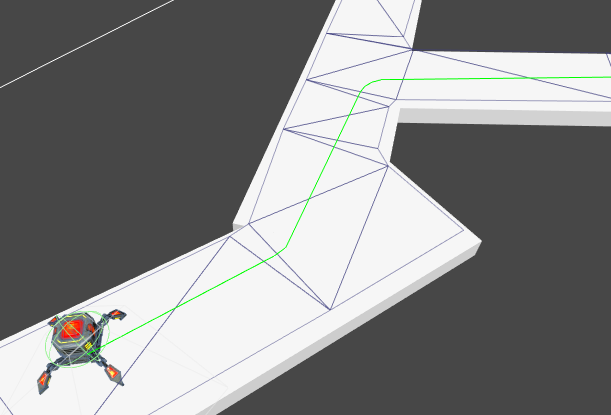 This modifier assumes all paths are in the XZ plane (i.e Y axis is up). It is recommended to use the Funnel Modifier on the path as well. Also check out the howto page "Using Modifiers". Apply this modifier on a raw Vector3 list. Called for each path that the Seeker calculates after the calculation has finished. Detail of generated circle segments. Measured as steps per full circle. It is more performant to use a low value. For movement, using a high value will barely improve path quality. Radius of the circle segments generated. Usually similar to the character radius. Calculates inner tangents for a pair of circles. Angle from the line joining the centers of the circles to the inner tangents. Add a to sigma to get the first tangent angle, subtract a from sigma to get the second tangent angle. True on success. False when the circles are overlapping. Calculates outer tangents for a pair of circles. Alerts the Seeker that this modifier exists.